Ndn application for sending out Interest packets in batches. No TraceSources are defined for this type. Size of this type is 696 bytes (on a 64-bit architecture). Definition at line 36 of file ndn-consumer-batches.hpp. Definition at line 57 of file ndn-consumer-batches.cpp. Definition at line 40 of file ndn-consumer-batches.cpp. Constructs the Interest packet and sends it using a callback to the underlying NDN protocol. Definition at line 86 of file ndn-consumer-batches.cpp. 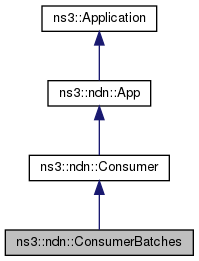 References ns3::ndn::Consumer::m_rtt, ns3::ndn::Consumer::m_sendEvent, and ns3::ndn::Consumer::SendPacket().